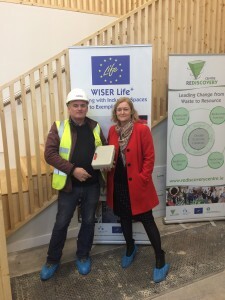 Blog > A Milestone day for WISER life as Rediscovery Centre receives the keys to Europe’s 1st 3D Textbook. A Milestone day for WISER life as Rediscovery Centre receives the keys to Europe’s 1st 3D Textbook. 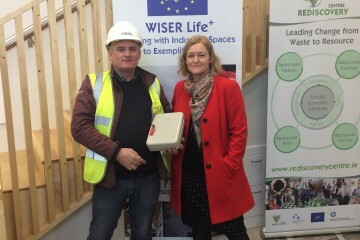 Today was a milestone day for the WISER Life project as Project Manager, Sarah Miller accepted the keys from Pat Diver, Site Manager (Purcell Construction). 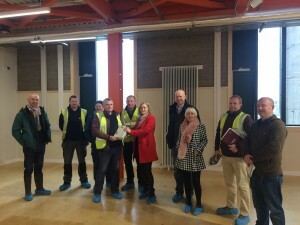 A small crowd gathered (left to right Darragh Lynch, Ollie D&N group, Gerard Griffin, Pat Diver, Joe Burke, Sarah Miller, Ronan Glynn, Carrie Ann Moran, Tommy Ellard & Roger Warburton) to witness the handover and participate in a welcome tour from Pat. Key features of the building were described in detail including the Building Management System which has over 500 data points monitoring the building’s operation.